2014 will be remembered for such highly publicized mega breaches as Sony Pictures Entertainment and JPMorgan Chase & Co. Sony suffered a major online attack that resulted in employees’ personal data and corporate correspondence being leaked. The JPMorgan Chase & Co. data breach affected 76 million households and seven million small businesses. 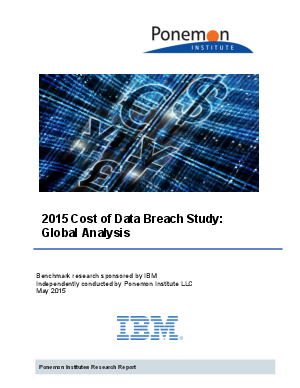 IBM and Ponemon Institute are pleased to release the 2015 Cost of Data Breach Study: Global Analysis. According to our research, the average total cost of a data breach for the 350 companies participating in this research increased from 3.52 to $3.79 million. The average cost paid for each lost or stolen record containing sensitive and confidential information increased from $145 in 2014 to $154 in this year’s study. In a recent Ponemon Institute study, 79 percent of C-level US and UK executives surveyed say executive level involvement is necessary to achieving an effective incident response to a data breach and 70 percent believe board level oversight is critical. As evidence, CEO Jamie Dimon personally informed shareholders following the JPMorgan Chase data breach that by the end of 2014 the bank will invest $250 million and have a staff of 1,000 committed to IT security.